The Dallas-Fort Worth English Springer Spaniel Association (DFWESSA) was established in May 1992. Our members accept the breed standard as written by our parent organization The English Springer Spaniel Field Trial Association (ESSFTA) and approved the The American Kennel Club as the only standard of excellence by which English Springer Spaniels shall be judged. DFWESSA will do all in its power to protect and advance the interest of all breeds of pure-bred dogs and to encourage sportsmanlike competition at dog shows, obedience trials, agility trials, and field events. 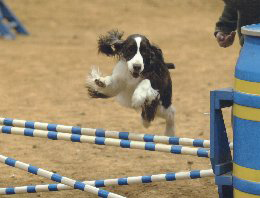 The club was licensed by the AKC to hold agility trials, obedience trials and conformation shows in 1997. Several years later the club became licensed to hold AKC hunt test. Our membership involves not only those interested in conformation and obedience but also in field work, hunt test, agility and tracking. In addition, we have members who are strictly pet owners interested in the preservation of the breed. This wide variety of interests have made the club a versatile group for any springer owner. The club also serves as a wonderful "forum" for the exchange of ideas on the breed as well as educational possibilities for the general public. DFWESSA has been active in rescuing English Springer Spaniels from area-wide animal shelters and from owners wishing to relinquish their pets. We support, monetarily, the veterinarian care for many North Texas rescued Springers needing health care. DFWESSA, respects the great efforts by the national rescue organization ESRA. From time to time, DFWESSA offers informal classes on general health care, grooming seminars and other training classes: we will also provide information on local conformation and agility classes. We generally meet on the second Tuesday of the month at varying locations in the metroplex. The public is welcome to attend our meetings. If you are interested in receiving a notice of our next regularly scheduled meeting please email us at info@dfwessa.com.